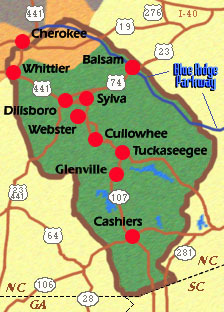 Visit small towns, the Blue Ridge Parkway, fast moving streams, wildlife, natural beauty, heritage, and friendly people. town circle on the Jackson County map or on a directory below. Click here to start your own online business for less than $ 20. Jackson County appreciates being included in the Mountain Area Information Network [MAIN] for western North Carolina. Neighboring counties in Western North Carolina on the map below.